We approached Smart Send to undertake a huge job, sending 690 Bundaberg Rum Party tubs to liquor outlets across the nation for a promotion. Smart Send handled this job extremely well, being on call to answer any questions and understanding the tight timings we were working to. Not one tub was damaged through delivery with Smart Send and all arrived at their destination promptly. Even when we requested some tubs to be re-directed in transit this was handled very professionally and most importantly in a kind and thoughtful manner. I would recommend Smart Send to organise freight for anyone no matter the size of the job because they truly care about ensuring their customers goods are delivered safely and on time. A big thank you to everyone at Smart Send for their excellent customer service and commitment to seeing a job through! I want to tell you about my experience with Smart Send. I recently used it for the first time for an eBay sale. It was so easy to work out the cost from your website and how to print the labels and organise the pick up time. I did a price comparison with two other freight companies plus Australia Post and Smart Send came out tops. With the other companies, I would have had to deliver the package to their premises. The pick up was within the requested time and date and the courier was very pleasant. I am so impressed with your service - five stars from this retired baby boomer who was concerned she would have trouble using this web service! I needed to get a 30kg package from SA to VIC and went online to find a courier service. I found Smart Send Couriers and despite my nervousness decided to give them a go. The goods arrived within 2 days in perfect condition with door to door service. Will definitely use Smart Send again. I just want to congratulate SmartSend on such a fabulous service. I have used many large courier companies over the years, with varying results (usually negative) where goods have been lost, damaged or simply delivered after the agreed date. I am now in the situation where I require the use of interstate couriers on a casual basis, maybe a couple of times each year. I stumbled across SmartSend while looking for a new provider and decided to put you to the test with a recent job I had. The things that initially impressed me about Smartsend were that I can book my job online, that I do not need an account, that I don't have to jump through hoops to get a pickup, and that I can pay securely online. I was then impressed with the service provided. I booked my job at about 9.30pm from home, received confirmation of my booking and consignment note within minutes (including very clear instructions as to what I was to do), the goods were picked up the following day at the specified time, I could track my consignment online, and the goods were delivered, in total (16 cartons) and in good condition the very next day, well within what had been quoted. All this at a very competitive rate. Thank you SmartSend. You will now get all my courier jobs, and I will be recommending you very highly to anyone I know. Just wanted to let you know that your man picked up our parcels on Wednesday last week at about 3pm and they have just been delivered to their destination in Berry Springs. Five working days from Frankston to just outside Darwin is fabulous! This is only the second time we have used you guys, and it won’t be the last!! Both times the goods were picked up on time and delivered before expected. This is generally unheard of in the freight business! And being able to do everything online makes it all a breeze. Even when the courier couldn’t find us to pick up the goods (we are in a new part of town) the girl that rang to find us was just so helpful and pleasant. What a nice change. Thanks again for a service that delivers what it promises. Last week I had occasion to use Smart Send for the first time. I had purchased a sewing machine on Ebay and needed it's transportation from Sydney to Brisbane. I googled couriers and found your company. The price and the service were both sensational and the arrival was so speedy I was shocked. Many Many thanks. I will not hesitate to use your company again, and will reccomend to anyone needing such service. Just a quick thank you for your great service, I recently purchased four, wheel rims from e-bay and contacted your company to pickup and deliver them for me. I received the items barely 24 hrs later and without any transport damage. Your services and that of your drivers is greatly appreciated and I will be more than happy to recommend you to anyone that would require freight services in the future. I think you guys have the best customer service i have ever used in this industry! Thank you sooooooo very much!!!! Once again, fantastic service, what a great company. I confirm that I have received the consignment note, twice. Thank you once again for truly great service. I would like to compliment your company for providing exceptional customer and delivery service. Thankyou for a smooth easy and reliable transaction. I would definately utilise SmartSend for my future shipping needs. Thank you so much for operating in this market as i had almost given up on courier companies for postage of smaller items. Hello, I feel compelled to email you to complement you on the outstanding service I received recently. I live in Brisbane and purchased a large and heavy computer on eBay from a seller based in Melbourne. The delivery of this item couldn't have been anymore straight forward or hassle free. 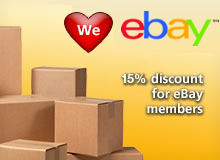 The door to door service is very convenient (especially for eBay purchases) and your rates are extremely competitive. I was kept up to date via your online tracking tool and my computer arrived in perfect condition and on time. I really could not fault your service and will have no hesitation using your services again and will be happy to recommend you to others. Hi I am so impressed!!!!!! I sent an email to you and you responded within the stated time frame. The pick up was within the specified time frame. My parcel was in Brisbane at 6am the next day. My parcel was delivered at midday the same day. Your tracking system let me know what was happening. And now I can see the receivers signature on line. This was great customer service all the way thank you. I didn't think customer service was a reality any more, you have restored my belief. Hi, I'm a contractor for Australian Air Express, I bought a guitar Amplifier on Ebay last week Item number: the listing said "pick up only" and being a contractor for AaE. I knew I could get employees rates. Unfortunately for me employees rates don't cover pick ups, they only cover depot to depot, so after a search on the net I found Smart Send, not only did you guys pick up and deliver door to door but you also beat AaE employees rates! My amp left Penrith Tuesday afternoon and arrived Gold Coast Wednesday afternoon for only $37.99 less than half of the next cheapest quote I received and absolutely blew AaE's quote away. I will be putting a link on ALL my Ebay sales to Smart Send, you guys are fantastic! Highly recommended. Recieved goods in great time and condition, will recommend you to all as i didnt think service like this existed cheers mate. Hi Chris, My apologies for the delay in replying to this request – I can honestly say that using your company for couriering was the easiest experience I have had in a long time!! I did my research regarding costs etc and being in business myself – how quick and easy it would be. The parcel (which was a baby’s cot in 2 big boxes) arrived an afternoon early and in PERFECT condition. I have got all my luggages and there is no damage. Thank you so much. You are very fast and safe. I would recommand you to my friends. Thanks again. Hi Steve, I am happy to say the computer was collected promptly at 11am on Tuesday and it has already arrived at the address in Sydney. My daughter will fly down this evening and is rapt that her computer is going to be there waiting. Thank you so much for all your help. Smart Send is a great company and I'll recommend you to all my contacts. Received a bumper bar that I had bought on ebay yesterday. It was delivered in perfect order and very promptly. Having NO experience in receipt/ despatch of goods in this manner, I must congratulate you on the wonderful service that you provide! Hi Chris, thanx for your efficient service and help, my item arrived today. Hi Guys II just want to give some feedback. From a sale on Ebay you delivered an item from Adelaide SA to Port Maquarie NSW which was picked up at 1.15 Tuesday and arrived Friday sometime. I consider that first class along with your price and reliable service. Selling and organising delivery has its sresses and to have things done so hassle free means a lot. Cheers and thanks. I'll use no other courier and will highly recommend you. Hi, Just used your online booking service. Found your web layout and booking procedure extremely user friendly and easy to use. Congratulations for a well set up website, hope delivery service is just as slick. Well the service worked out really well. It was really easy and far better value than anything I could organise myself. The surfboard also was delivered in 2 days. I will definately be using you guys again. Can I suggest that you put some sort of testimonials section on your website? I use online services all the time but I was a bit concerned about using you guys for the first time as you had no phone number and no point of contact apart from an email form. Hi, Just wanted to let you know that I purchased an item from eBay, found your company via a Google search, and you were the cheapest by far for my items. (Con note number : SS009711) I asked the seller to arrange transport through your company and my items were delivered in a couple days (Melb to Adel). Just wanted to say thank you, great service and price, I'll be recommending you to others and using you myself again. I would just like to thank you for an efficient and well priced freight service. I will have no hesitation in using you in the future and will recommend you to all of my friends and associates. Many thanks for my delivered item which arrived safe & sound & so very fast also. I would like to thank you & the Smartsend team for a great service. I am a new customer to Smartsend & would definitely book you again & would have no hesitation in recommending you. Hi. I had a bit of a look at your site for somewhere to post positive feedback. I have used you for 3 shipments interstate in the last couple of months and have been so happy with the results each time. All three have been ebay shipments, and large items. The fact that i can book online and know that the courier will arrive and deliver well before the expected time is outstanding. Anyways thanks so much and u have ALL my business and anyone i come into contact with as well. This last one, the guy asked me for your details, so he was impressed too. My pram arrived this morning. Thank you for your promptness I will be recommending you to all the sellers I deal with on Ebay My Pride of Workmanship Award goes to your company from me. 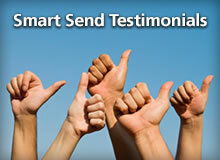 Hi, Just emailing to let you know that I am really impressed with Smart Send's service. I sent a computer to NSW and it arrived within five days and in excellent condition and no hassles either end with pick up and delivery. I also arranged to have picked up in NSW a roller door and again it was a very simple transaction and the door arrived in excellent condition. So thanks-I'd definitely recommend your service! Just some feedback on your service. I am a first time user and the experience has been perfect. On-line quote and booking is fast and easy. Pick up was no issues and delivery was faster than expected. On top of that, the price was more than competitive. I have recommended the service to others and will continue to use the service. Great job. Regarding booking no SS007569, I can't help but totally impressed by how prompt the pick up service is, and how my request can be attended accurately (I doubt the courier can come around 02:00-03:00 as per my request and the courier arrived at 02:37!! woah!) I just had to write a thank you email for such a great service! 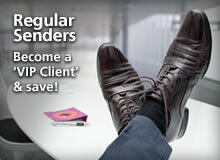 Will definitely use SmartSend for all my other dealings! :) No hassle, easy to get quotes, and a great service! I'm totally impressed!! Will recommend to other sellers too!! you guys rock! The consignment arrived at 11:13am. LESS THAN 48HRS AFTER PICKUP!!!! Hello. I used Smart send last week to send 3 heavy boxes from Lawnton to Bowral. Wow you guys got them there in 2 days. My customer was thrilled and I am over the moon with the service. Christie, Just to let you know after all the hassles with the Seller from Runcorn, my packages arrived safe and sound yesterday. I really appreciate the efforts you and your people went through to make this happen despite the unfortunate obstacles. Thanks Wendy & Chris - bag received today in perfect condition and with all the surprises I have been waiting for inside the bag. GO SMART SEND!! I'll be recommending this service. I have just received my package which was picked up yesterday. I am so impressed with your service that I wanted to email you to say thanks. I will use your service again and now have the confidence to bid on items interstate. I will also recommend you to all my friends who also can use your service. I just come across you guys on a google search. How easy was this! It almost seems too good to be true, I just enter the details - postcodes, dimensions, addresses, etc and book the item for shipping. Is that truly it? I have a number of items on ebay and I will be using you guys. I have been selling on ebay for a few years and have used www.roadairdirect.com.au for sending larger and heavier items interstate and I thought their prices were reasonable. Just recently, one of my clients suggested I quote them from your website. I have done a few quotes and compared them to the other mob and you guy's always come out on top for being cheaper. I have just put a booking in to send a parcel to QLD and to my delight you send back a link to print off the Con note and address label, what a brilliant concept! I will be using you guy's again in the future I'm sure, keep up the good work! Our catcher arrived 5.30p.m. today & we just want to thank you all for the wonderful service. We will recommend Smart Send to everybody who needs a courier service. Thanks again. Just wanted to drop you a quick email to let you know how happy we were with Smartsend. You were all so efficient and professional and our boxes arrived earlier than expected. We will definitely recommend you in the future. My parcel arrived at 9:48am today. I have been tracking it from the time I booked the service. I am left most pleasantly speechless at how so very efficient and fast Smart Send is with its service. Whatever the business model, it works marvellously! Your driver who delivered the parcel was most courteous too. I want to congratulate and to thank Smart Send for a brilliant level of service all round -- far better than Pack and Send. From now on I shall be forthrightly recommending Smart Send to my university where I work, which has 26,000 staff and students, and to many other businesses I know. Thanks, again. And best wishes. I just received my package yesterday and I am extremely happy with your service. Just over two days door to door North west Australia to Canberra. Fantastic, I'll be using your services for all my packages from now on. I just wanted to say thanks for the awesome service you provided recently. I had previously used another courier and their website booking system has changed. It wouldn't accept my payment! I looked on google for an alternative and found Smartsend. I booked my delivery and my parcel was shipped and delivered from Brisbane to a small town 50 minutes out of Newcastle in less than 24 hours. 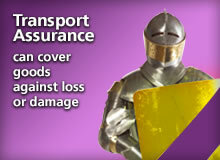 Amazingly quick, fair price, friendly courier at Newcastle end and I have a new courier should I need anything shipped. We recently had a first experience with your company, and are writing to tell you how pleased we are with it. We are the recipients living in central Queensland of a parcel sent from outer Melbourne. The consignor was very happy with his dealings with you, and tells us that he will definitely use you in the future when the need arises. From our side, your price was very reasonable; we loved the ability to be able to track the consignment en-route / in transit; and the delivery was made in a timely way, by a very friendly and professional gentleman from Gin Gin; with the contents in excellent condition. So thank you for providing such a good service. May your firm continue to prosper! Best wishes from Central Queensland. My recent experience with Smart Send was fantastic! An ebay item located in NSW was delivered to me (in Elwood. Vic) within 2 business days. Great service and goods arrived undamaged. For the second time I used your service in relation to an Ebay purchase, and I am very impressed! The prices and speedy delivery have me hooked! The website is informative and very easy to navigate and use, I will not only be using you again in future, I will also be recommending your service. Thanks again for a very positive and worry free experience. I went looking for alternatives after Australia Post jacked up parcel and satchel rates by around 35% in 3 years. Now I can use SmartSend and they come and collect the parcels and cartons, no more 20 – 30 minute queues at the Post Office, dreading the person in front of you has a Passport application!! The SmartSend service is quick to arrange, has full tracking and is competitive. Even better the customer service response is almost immediate and on weekends as well.